This Stunning Bianco Ora venetian masquerade mask is made from white laser cut metal and is for a lady with discerning taste. 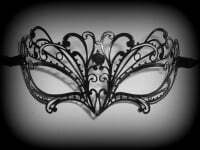 This beautiful mask is taken from the Simply Masquerade designer mask collection - The Bianco Ora is a classic design that anyone will appreciate. The mask is intricately crafted from Bianco white laser cut metal added to which is golden glitter & is stunning in it's simple yet elegant arc scroll design which gives it added character and mystique. A truly unique mask for any occasion. The genuine Swarovski crystal brilliantly showcases the elegant design giving it an antique yet still very contempory feel that any lover of masks would enjoy. 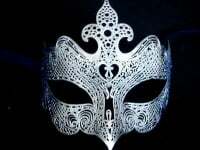 The extravagantly designed & handcrafted Venetian Bianco Ora designer Venetian mask is for women who want to look and feel like a millon dollars at the masked ball! 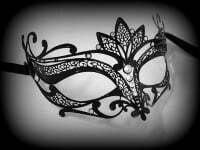 A stunning mask design that is only available at Simply Masquerade.